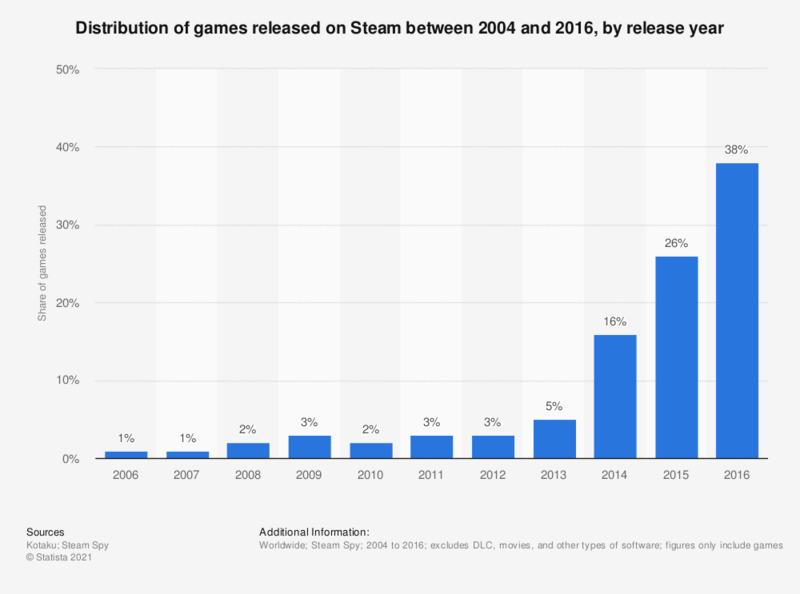 This statistic presents the distribution of games released on Steam between 2004 and 2016, by release year. According to the findings, from 2006 to 2016, there has been a large leap in game releases on Valve’s gaming platform Steam. In 2006, the total distribution accounted for around one percent, while in 2014 that value entered the double digit range, with a 16 percent share. Recent data revealed that 38 percent of the total number of games released on the platform in the measured period were made available in 2016. Years 2004 and 2005 both had distribution values that were under one percent. 2004* = 0.06% and 2005* = 0.05%. Figures were rounded.